Visit a lot of World's Heritage Sites and explore the legendary Avatar Hallelujah Mountain. Upon arrival at Beijing Capital International Airport, you will be picked up to your hotel. The rest of the day is free for you to start exploring this great city. Today's excursion will take you to the Mutianyu Great Wall - one of the most grand sections of the Great Wall around Beijing. The Mutianyu Great Wall is known for its surrounding beautiful landscape changing with seasons. We will spend 2-2.5 hours hiking and enjoying photography on the wall. You may choose to take the round-way cable car up and down the wall (cable car is optional, CNY80/pp). Afternoon pay a visit to the Pearl Factory. Then drive to have a Hutong tour by a 3-wheel rickshaw and then visit a local family living in a Siheyuan (Chinese quadrangles) in the Hutongs. Today, your trip will start with a leisure walking across the largest square in the world - Tiananmen Square, and then enter the Forbidden City - the largest imperial palace in China for 24 emperors’ reign during the Ming and Qing dynasties with a history of around 600 years. In the afternoon, transfer to visit the Temple of Heaven - a masterpiece of architecture and landscape design where the ancient emperors used to pray for the God’s bless of the whole nation. 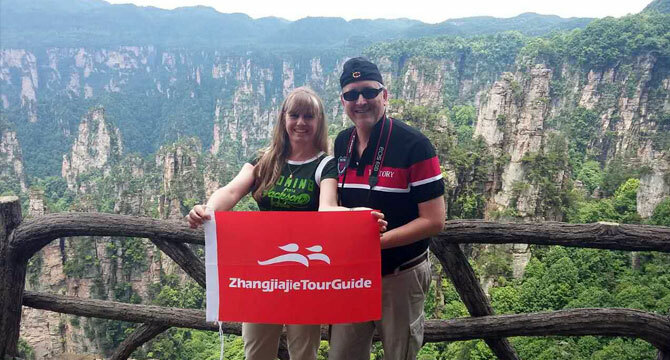 After the tour, you will be transferred to airport for your flight to Zhangjiajie. On arrival at Zhangjiajie, our local guide will meet you and drive about 40 minutes to your hotel at Wulingyuan Scenic Area. After breakfast at your hotel, you will then ascend the Yuanjiajie Mountain by the world famous Bailong Elevator. On the summit, you will hike about 2.5 hours to see the Pillar of the Southern Sky. It was used to inspiration for the famous “Avatar Hallelujah Mountain” seen in the Blockbuster movie, Avatar. Then proceed to the platform of Forgetfulness to enjoy the nearby breathtaking landscape of the sandstone peaks and then walk across the No. 1 Bridge under Heaven. Climb up the Tianzi Mountain to visit Helong Park and other sites. Later, take a cable car down the mountain and go on sightseeing along the dreamlike Fairyland –Ten-mile Natural Gallery (mini-train is optional). After breakfast, enjoy a walk (about 2.5-hour) along the Golden Whip Stream – this charming valley is most likely to bring you into the Pandora's wonderland in the movie Avatar. Then move on to Baizhangxia Valley) and walk to the beautiful Baofeng Lake to enjoy a short cruise. End the trip with an airport transfer. Between airports, hotels and scenic spots while sightseeing in Zhangjiajie by the private air conditioned vehicle with driver.